Dr. George Hopkins as a young doctor when he first arrived on Saba. 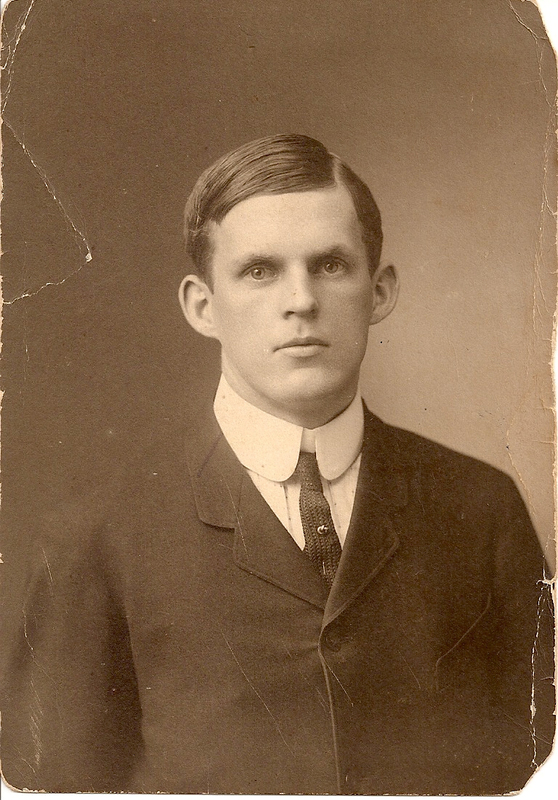 Dr. George Richard Hopkins graduated from Tufts College Medical School on June 17th, 1908. There was also a student from Barbados at Tufts and he told Doctor Hopkins that the Dutch Government was looking for doctors to serve in the West Indies colonies. Doctor Hopkins started working on Saba in 1908. Exactly one hundred years ago. He came to the island with his wife Lucy Graham Hopkins and baby daughter also named Lucy. Doctor Hopkins sister-in-law, Flossy Rayfuse visited Saba a few years later. She died at the age of 93 in California. She wrote about Saba as it was at the time. I got a copy of what she wrote years later from Lucy who lived in Florida. “About fifty years ago the Colony Curacao (six islands) was very poor and the Dutch in Holland had great trouble to find doctors to come here. Every well-educated man wanted to go to the Dutch East Indies, rich islands where a lot of money was made. George was just a few months from the end of his studies. He was married and Lucy was already born, so he was on the lookout for a job to begin with as soon as he had his doctor’s title. He had a class-mate a Barbadian, who had a sister, a nurse. This nurse had a love affair with an Englishman who worked for the Dutch in St.Eustatius (the love affair must have been going on during their stay in a Baltimore hospital). One day the Barbadian nurse wrote to her brother that she had heard from her sweetheart (the British doctor) that there was a vacancy for a medical man on the Dutch island of Saba and she wanted to know if he was interested. He told George about it and said at the same time that he did not want to go to Saba. He was a Barbadian and he intended to go back to Barbados. So George asked him;”If you are not interested, why not get the information for me? Do you object to that?” The Barbadian did not, so he wrote to his sister. They received the wanted information and George applied to the Dutch Government. 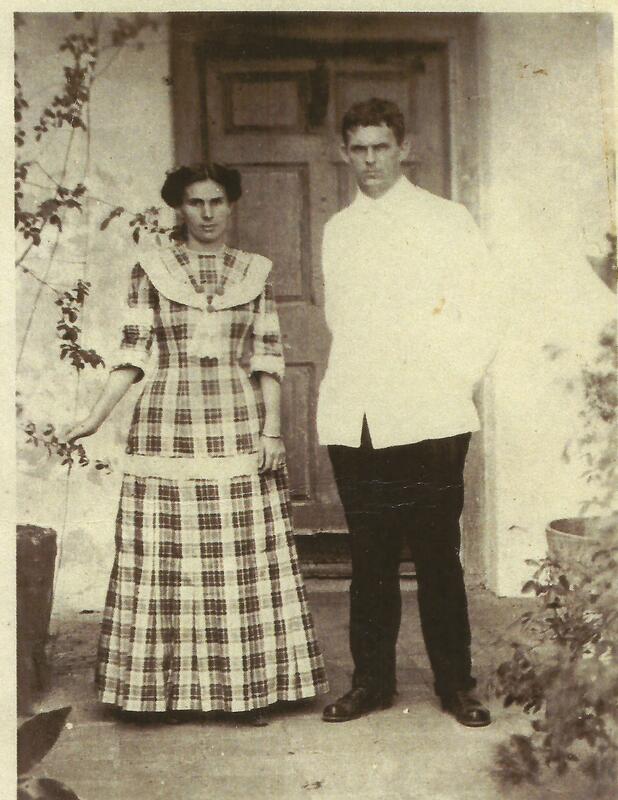 Dr. George Hopkins and his wife Lucy, Saba 1910. Months passed, both forgot about it. George started to look around for a place to establish him self and he had already decided on some village around Rumford (Maine). He had visited an old doctor there and the old man had told him there was an opportunity for a young doctor. It would have been too expensive to start a practice around Boston, but George thought that in the backwoods he would only need a horse and carriage; in winter a sled and snowshoes and the office would have been in the front-room of his house. “All at once there came a reply from the Dutch Government in Curacao. George had given references with his application. They had made enquiries and the job as a doctor in Saba was offered to him. The letter was in Dutch, so there was the first difficulty. He had a Belgian neighbor and went to him, and this man knowing Flemish pretty well translated the letter. The salary offered was f.2500.—yearly minus 8% for something. The Belgian could not figure out what for, so George decided that must be some kind of graft. He decided to agree to that, but the “f” was considered by the Belgian as being francs (then $0.20). George decided he could not live on that and wrote back that he was willing to come but not for fcs.2.500.—but for fcs.5.000.–, so again nobody expected that anything would come of it. Another surprise followed, the Dutch Government wrote him that the salary was really what he wanted as f.2500.—meant florins just twice the amount of fcs.2.500.—as he thought he would receive and the 8% reduction was for his pension. 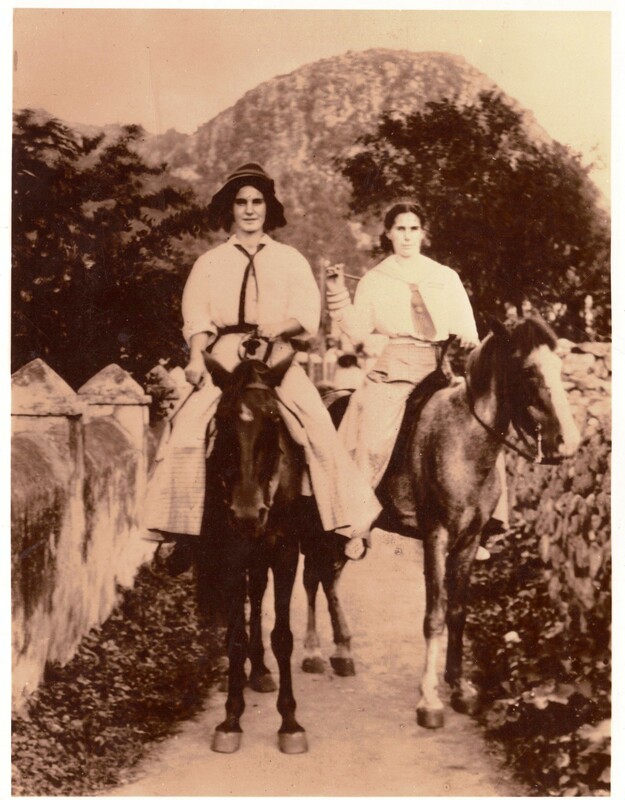 Lucy Hopkins and her sister Flossie riding horses on Saba. “After further information George decided to accept the Dutch offer and start his career as a doctor in Saba. First he had to find out where this island was situated. He found the little spot in the Caribbean. All the preparations were made and George, wife, and baby Lucy journeyed to Saba, by British boat from New York via the Danish islands of St.Thomas, St.Croix to St.Kitts. From this last island by small sailing vessel to Saba where they landed, just when it was getting dark on Fort Bay on August 30th, 1908, eve of Queen Wilhelmina’s birthday. Saba and as the hurricane season had started no sailing ships were risking trips on the Caribbean, so the doctor’s family lived for months in a house wholly furnished with borrowed goods, but the population was very nice about it. Dr. George Hopkins when he owned the Belle Plaine estate in French Quarter, St. Martin. Although George did not know anything about Holland and Queen Wilhelmina, he enjoyed especially the celebration of Queens Birthday one day after arrival in Saba. Most of the transportation was done on horseback on mountain paths and partly on steps, cut out of the side of the mountain. 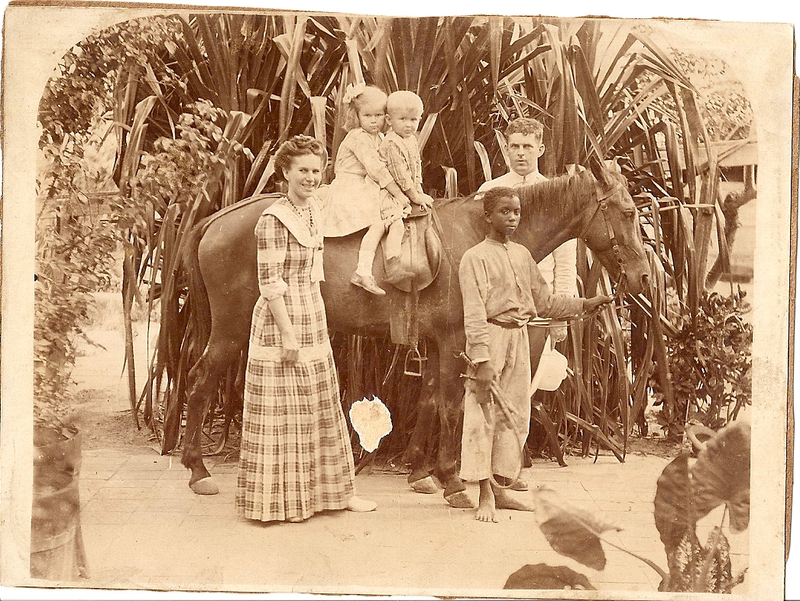 Mrs. Hopkins became an expert horse-woman and George had the honour of designing the first divided skirt for riding in Saba. Side-saddle was too dangerous on those trails. George’s mother was a dress-maker, so in his youth he had seen a lot of models etc. and being rather handy he understood how the shape of the horse-back riding skirt had to be, so the doctor and a few women started on this experiment and it was successful. George had a pretty good surgical training in his last year as an intern in a hospital, so because of the hurricane season, and the only way to get out of Saba was on a sailing-ship, he was pushed into doing rather serious operations. His assistants were the schoolmaster and the shoemaker, the operating table was the kitchen table. In the beginning George did only refractions, but as time went on, he understood he might be able to help the people there by doing cataract-operations. Even when transportation was possible most of his patients in Saba could not afford to go somewhere else to have an operation. So with the help of his medical text books for theory and sheep’s eyes as practical material, he started on his career as eye-doctor. Life was fairly pleasant on Saba. Food was sometimes kind of monotonous, especially when you were virtually shut off from the rest of the world during hurricane season. Canned salmon and chicken was very much on the menu. Once in a while somebody came to ask you if you wanted meat, and if there were enough customers some man went out to shoot a goat. If he was successful you had a roast the next day. If not you tried to find a new method to prepare chicken or canned salmon. Another photo of Dr. Hopkins. Fresh fish was available quite often and sometimes turtle. There was never beef, once in a great while veal. In the course of 1910 Mrs. Hopkins left on a trip to the States. She was pregnant and expected to have the child in the States, but she changed her mind and in August decided to go back to Saba. Landing in Saba is always some kind of adventure. The ship stays off-shore. Blacks come to meet her in a rowing boat and you are launched ashore through the surf. Nearly always you are soaked through when you step on land. When Mrs. Hopkins arrived the sea was especially rough. Landing in the Fort Bay, the most convenient one was impossible. So the ship had to go to go to the Ladder Bay and a rowboat met her there. Mrs. Hopkins was 8 months pregnant and not in the best condition to go through that kind of adventure, but she was there and had to land. The miracle was performed and a big strong black man took her upon his shoulder and carried her up the mountain to meet George there. He went out to meet her from the Fort Bay, but they could not come back the same way. Part of the way higher up a horse was available to carry her to The Bottom. There are also steps cut out of the mountain from the Ladder-Bay, but they are too steep for horses, so big husky black men do the job. Saba is one of the West Indian islands where the population is proportionally dominating white. Very few mulattos’, that shows there is hardly any mixing of races. Whites and blacks live in villages very near to each other, but very definitely apart. That was in 1910, how it is now we do not know. Population mostly old men, women and children; younger men were mostly sailors. They had in that time their own navigation school. Young men started early to go to sea, then they came back and generally got engaged to get married. Generally stayed long enough after the marriage till they were sure that a baby was expected, then, took another trip again to make money to support the family. Then on their next stay home generally another baby was launched. 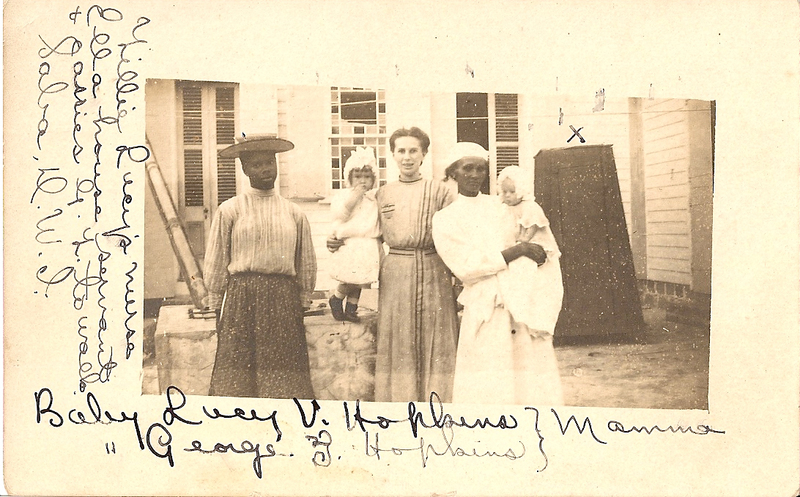 Lucy Hopkins with her maids and two children on Saba. Lots of the white sailors from families of The Bottom became first mates and Captains of big ships. They generally reached better positions than those belonging to Mary’s Point, they became bosons etc. Saba sailors have a very good reputation. In the early 1960’s Dr. Hopkins received from Governor Cola Debrot the distinction of Knight in the Order of Oranje Nassau for his services to the Netherlands Antilles. After some years on Saba where he also serviced St.Eustatius he moved to St.Maarten, on March 31st, 1911. There he bought the Belle Plaine estate from Diederick Johannes van Romondt. During his European vacation in the First World War he served as a doctor on the hospital ship “The Hope” which accompanied the fishing fleet, and then he moved to Aruba after which in 1932 he was transferred to Curacao. Dr. G.R. Hopkins was born in Brewster Maine on June 7th, 1884. 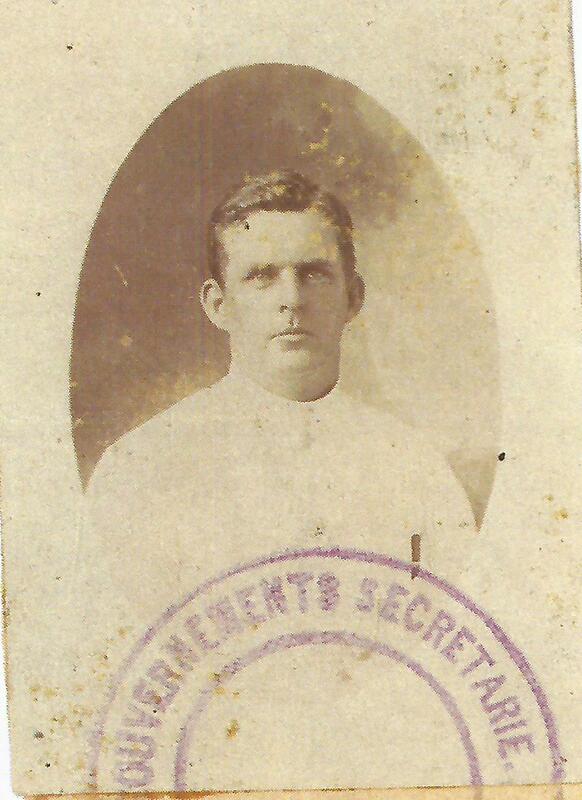 He worked as government doctor from 1908 to 1934 after which he retired from government service. He then started his private practice as he was an eye specialist in the meantime. The practice he had on Saba on the people there and using his sheep’s eye had done wonders for him. His office was located in the “Heerenstraat”. He died on Curacao and is buried there. I have a file with many of his documents including a copy in French of his bill-of-sale for “Belle Plaine” estate which he bought in 1912. In ‘Saba Silhouettes” by Dr. Julia Crane, Mr. Carl Hassell tells the story of Dr. C.A. Shaw, who was on Saba from February 1899 to February 1903. He relates; “Meantime there was no doctor on Saba then. Finally in Barbados we get talking. The man out there used to come aboard and sit and talk; and finally we found out he was a doctor, one looking for a job. Well, the captain told about Saba had no doctor, and perhaps he might be able to come here and get the job. So, all right, the captain of the schooner belonged to St.John’s. He says, “Yes, yes, I will give you free passage to Saba.” All right we came along and we introduced him to the office, but the office said he would have to go to Curacao and pass examination and so on. But then he had no money. He was just in his pants and shirt. He was from Nova Scotia. You had to travel by schooner from here to Curacao – what they call a packet that run once a month. You get there in a months time and back. So we took a collection here on the island. He done quite a few jobs while he was here. The government give him permission to work, you know. He remained here about a month, and finally we get together enough money to pay his way to Curacao; and exactly they accepted him. The government of Curacao accepted him, sent him back, put him in his position, and he was a splendid doctor. Doctors were important enough in those days to warrant mention in “Memories of St.Maarten” by Josiah Charles Waymouth. In Chapter V he mentions;” At his departure, as already detailed, the writer had left in his island home, doing duty pro temp. as government physician, in the place of Dr. Shaw, Dr. Cristensen. For those who want to read all kinds of other information on the life of a doctor on a small island I would like to recommend reading Doctor Robert Mols’ book:” Doctor on Saba.” Also for those who think it is difficult today just imagine being held down by the schoolteacher and the shoemaker while the doctor takes out your appendix on the kitchen table without the help of an anesthetic.